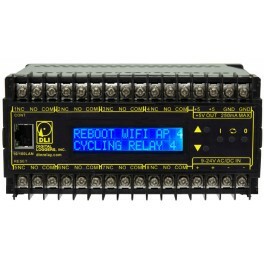 The DLI DIN Relay makes Web switching affordable! Get a complete web server, power supply, auto-ping, clock/calendar, and eight relays all in a miniaturized package at a breakthrough price! Control anything anywhere! Do it reliably. Save time, eliminate service calls, save power. Reboot remote routers and APs. Control and sequence lighting, machinery, all via the web! Customize the web server with your own links. Do it all securely from your browser. You can quickly write programs for autonomous control. Utilities like our new email alerter are included free. 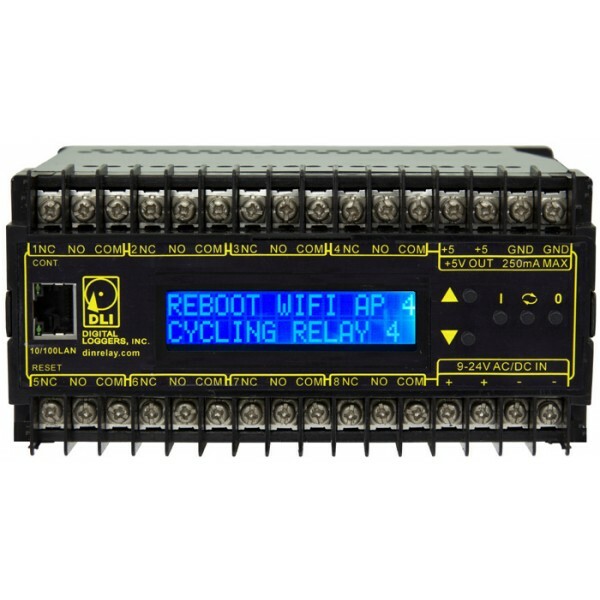 Includes a real-time-clock with battery backup , NTP, and local time sync. There's a fully programmable LCD and a keypad for setup and local control. AutoPing is faster and more flexible. Use the new scheduling feature and BASIC scripting to quickly implement control systems without the hassle of a complex PLC. Over 150,000 are in use today.